Use this checklist as a guide for adjusting your equipment and furniture. It may help you become more comfortable and relieve damaging pressure on your body. Check the elbow and knee angles in the diagram. relaxed and the elbows are at approximate right angles. Refer to 5 & 6 on diagram above. Check that the feet are flat on the floor, knees are bent at right angles and thighs are parallel to the floor or tilted slightly forward. Refer to 1 & 4 on diagram above. Adjust backrest (vertically) so that the lumbar support fits in the lumbar curve of your lower back. Refer to 2 on diagram above. Adjust backrest (horizontally) so there is a couple of fingers’ space between the front edge of seat and the backs of your knees. Adjust seat tilt so that your hips and the tops of your thighs are at right angles (or slightly greater). Not all chairs have a tilt adjustment - this is OK as long as you can maintain a right angle (or slightly greater) between your thighs and hips. Refer to 4 on diagram above. This helps to ensure there is no undue pressure on the back of your thighs. Armrests are not recommended for keyboard work but may provide support during other activities (e.g. telephone use, meetings, etc.). If the chair has armrests and these are interfering with access to the desk you should have them removed. An upright or slightly reclined posture is recommended. Be sure the backrest supports your lower back and keep shoulders relaxed not hunched. Refer to 9 on diagram above. 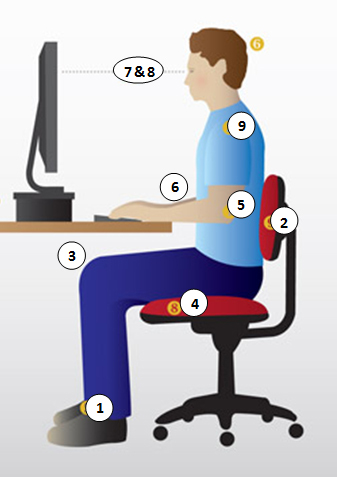 Adjust desk height so arms and forearms are at right angles or slightly greater, and the forearms, wrists and hands are in a straight, neutral posture. Refer to 5 & 6 on diagram above. If desk is not adjustable increase your chair height (see Chair & Posture section above) and use a footrest. Space under the desk should allow free leg movement without obstruction. Refer to 3 on diagram above. Depth needs to allow a proper sitting position while giving foot/knee clearance. Keep wrists in line with forearm. Avoid supporting your wrists on the hard desk surface while typing. Generally wrist rests should not be used to support the wrists whilst typing– they should be used to provide support when resting between typing tasks. Position mouse close and on the same level as the keyboard, keep the elbow close to the body. Do not operate the mouse with the arm stretched out. Adjust monitor height so top of screen is at or slightly lower than eye level. Refer to 7 & 8 on diagram above. Viewing distance is approximately an arm’s length away. Refer to 7 & 8 on diagram above. Monitor and keyboard should be placed directly in front of user to avoid twisted postures. Characters on the screen should be clear, have no flicker and be of suitable size. Keep frequently used items (e.g. telephone, books, and stationery) close at hand so that you can reach the items without stretching. Large or heavy items should not be placed above shoulder height. Use a document holder if working from other documents extensively – do not place documents on the desk in front of the keyboard or flat on the desk to one side. Preferably the document holder should be positioned between the keyboard and screen to avoid neck twisting or positioned close to the screen on one side (and alternated if possible). When using your mouse/keyboard repetitively remember to take micro breaks. This may be a short pause to relax hand positions, look away from the computer or stand and stretch your legs. Try stretching your body to reverse your posture, allowing muscles to relax. Break up long periods of continuous computer use by performing tasks with different demands such as photocopying or filing. Avoid ‘batching’ of work and try to rotate tasks regularly. A headset is recommended if you are performing combined telephone and keyboard tasks for extended periods. If you require glasses, single strength lenses are recommended. Bifocals or graduated lenses are normally not suitable for computer use. This can be dependent on the user. Glasses for computer use should be discussed with your optometrist. Please list any items above where you were unable to adjust the item/equipment to suit your needs.